This picture describes me so well! As much as I already know about the Beatles’ existence, there’s nothing quite like the thrill of seeing the same magical story told over and over again. It’s almost like seeing a favorite musical continually revived year after year. In other news, Paul has begun touring again after a health scare in May. Thank goodness he is better, and judging from a video of a recent concert, he appears to be in his usual top form. I know this may sound greedy considering that I’ve already seen Paul in concert once, but I would give just about anything to see him again. Those fireworks during Live and Let Die were even better than advertised! This is a bit unrelated, but thanks to tangerinetrees99, I found this incredible list of symptoms of Beatlemaniacism, which I will share with you. I think at least 90 of these apply to me. And yes, I did bother to read the entire list. 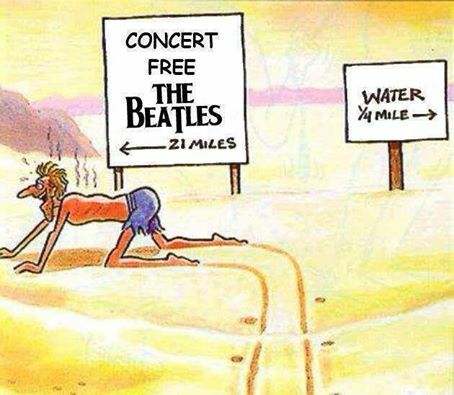 That’s what any true Beatlemaniac would do! You Know You’re a Beatlemaniac… Part 7! John, apparently doing his Elvis impression. Okay, I think this segment is becoming a bit of a joke, but since I keep coming up with new Beatlemaniacism symptoms, I figure I should do my civic duty and continue posting them. Here we go, yet again! If you have any symptoms of your own that you’d like to share (don’t be embarrassed… There is no shame in being a Beatlemaniac), feel free to comment! – You freak out when the category on final Jeopardy is “The Beatles,” inform your family that you have waited your entire life for this, and promptly get the question right as soon as it displays on the screen. Oh yeah. – When you click on a Beatles video on Youtube, you automatically click “like” before you even watch it. – You constantly try to figure out the Beatley configurations of various four-person ensembles. I sort of stole this from a blog post I read, but among the Big Bang Theory cast members, I’ve decided that Sheldon is John, Leonard is Paul, Raj is George, and Howard is Ringo. See what I mean? – You compare every concert you go to with the Paul McCartney concert you were fortunate enough to attend. But none of them, not even Elton John, can top the mighty Macca. – You’ve joined multiple Beatle-related groups on Facebook. – You know the exact spot in Let it Be where Paul hits a wrong note on the piano. I’m surprised they left it on the album, but it was the Let it Be album. The Beatles didn’t even care enough to oversee the production… Enter Phil Spector, and the rest is infamously history. – You always write about the Beatles in your SAT essays because they apply to so many different themes of life. Creativity? Check. Hard work? Check. Determination? Check. They’re basically the “To Kill a Mockingbird” of the music industry. – You sometimes start subconsciously singing Beatles songs while walking down the street without even realizing it. – Your respect for a musician or a famous person automatically skyrockets if you find out that they like the Beatles. – You shrieked with delight when Paul won yet ANOTHER Grammy, which seemingly happens every year these days. He’s still a force to be reckoned with! – If you’re about to leave the room and a Beatles song comes on the radio, you make up an excuse in your head about why you can’t leave the room just yet and stall for the length of the song. – Whenever you’re running down the street, you feel like a Beatle in opening scene of A Hard Day’s Night when they’re running away from screaming fans. – Whenever you watch that scene from Ferris Bueller with Twist and Shout, you sing along. – Many of your friends mention the Beatles when they write messages in your yearbook. – You’ve decided that if you ever got a Twitter, the first person you’d follow would be Paul McCartney/The interns at paulmccartney.com. Let’s face it, he’s definitely not writing his own tweets, but it’s still worth a follow. Yes, I know it’s Paul’s birthday, but I started this a couple of days ago and wanted to finish it. A birthday post will be on the way very soon! You Know You’re a Beatlemaniac… Part 6! 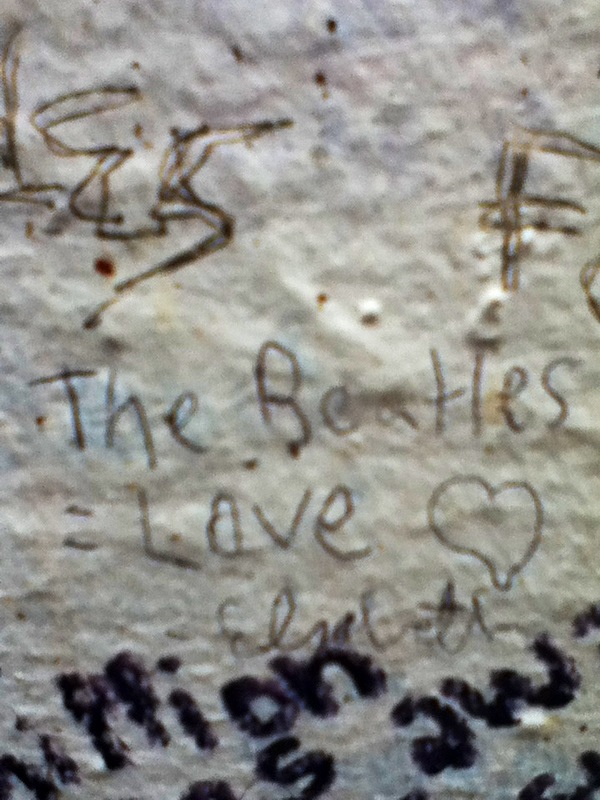 This is what I wrote on the wall outside Abbey Road Studios. Short, sweet, and to the point. – You thought, for quite a while, that the Hofner violin bass played famously by Paul McCartney was the only type of bass guitar in existence. – You and your friends are STILL quoting the SNL sketch from last December that featured Paul and Martin Short. – If you’re out somewhere where there’s a DJ and you have the opportunity to request a Beatles song, you always take that opportunity. – You occasionally tear up out of the blue at the thought of George not being in this world any longer. All things must pass, but George will live forever in your heart! – Hearing the news that the royal baby’s name was George made you VERY happy! – You lie in bed at night listening to the Beatle Christmas messages just to silently fangirl over their adorable voices and hilarious antics even though it’s nowhere near Christmas. It’s never too early to start celebrating! – When you’re listening to their music, you get so into it and lost in Beatleland that you sometimes actually forget where you are. – You pay extra attention to a conversation if you hear that someone’s name is John, Paul, or George. But let’s face it, NO ONE is named Ringo besides Ringo himself! – You listen to Beatles music for nearly the entire duration of long plane rides or car trips to keep yourself entertained. – You are a Beatles completest who must own every version of every song they ever recorded, ever. – Your name on Doodle Jump and other assorted apps is something along the lines of, “#1 George fan”. – Even though you’re a girl, you wish that you could sing like the Beatles. If I had Paul McCartney’s golden voice, I would thank my lucky stars every single day. – You’ve memorized every note of every Beatles guitar solo and insist on singing along to all of them. – You freak out when the Beatles are randomly mentioned in museum exhibits. Yes, it does happen. I was with my family at Kensington Palace this summer and they had an special exhibit devoted to the fashion of the royal ladies of the past 50 years. There was a video showing Princess Margaret wearing some pretty frock and meeting the Beatles that was being shown on repeat, and it took me about 10 minutes to leave that room. – You also freak out when there’s an SAT practice question about the Beatles and how the large majority of people consider them to be the greatest band of all time. Wow. If this happened on the actual SATs, I would probably be very distracted and disoriented, so maybe it’s better that most SAT questions are not Beatle-related. – You have emotional (well, emotional on your side) conversations with your teachers when they comment on something Beatle-related you’re wearing or that you’ve written. – You say, “Good day Sunshine!” every time you see your neighborhood cat, whose name just so happens to be Sunshine! – You’ve considered simplifying things at Christmas by asking for Paul McCartney. Just Paul McCartney under the tree, maybe with a festive bow. That’s all you really want. – You love finding pictures of the Beatles doing random, normal human things like washing their hands, playing with their kids, eating (preferably fish and chips), or driving. It makes them seem less like gods and more like actual people to you. – You will insist to your future spouse that one of your kids is named at least partially after a Beatle, whether with a first or middle name. I love the name Gavin, for some reason, so how about Gavin Paul for a young lad? George Eric? John Elton? Okay, maybe not John Elton, because when little John has to write his last name first and his first name last, it will read “Elton, John.” And you would never put that kind of artistic pressure on a young kid. It wouldn’t be fair. That’s all for now. Enjoy the rest of the weekend! I will try to review Elton John’s new album, “The Diving Board,” tomorrow! Have a wonderful rest of the weekend! 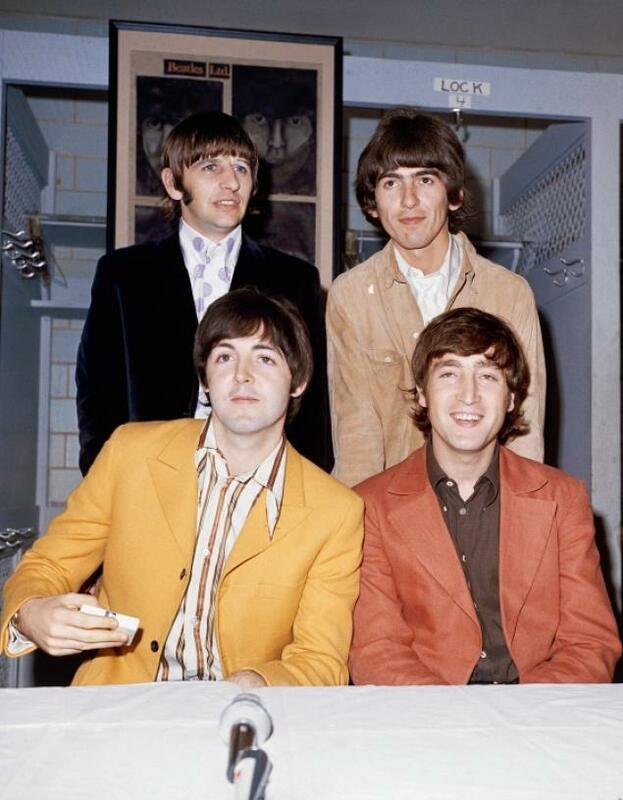 You Know You’re a Beatlemaniac… Part 5! Well, here we go again. I’ve come up with more “You know you’re a Beatlemaniac” symptoms, which, as usual, all apply to me. I hope you enjoy this continuation of a series that I honestly didn’t think I’d continue past the 3rd installment, though here I am again! – You’ve never seen Let It Be because you know it’ll make you sad to see the Beatles breaking up right before your eyes. That’s honestly how I feel about this movie; I refuse to let myself watch Let It Be before I become a more mature Beatles fan and can handle it. – You’re extremely frustrated that no one invented a time machine in time to save John and George’s lives. Life is not fair! – You looked up “grotty” on no less than 8 different websites, INCLUDING Oxford English Dictionary, just to prove to your family that it did, in fact, originate from the movie A Hard Day’s Night. You have no idea how incredibly satisfied I felt to actually be right about this. Beatlemaniacism strikes again! – You think that you may soon need to dedicate a whole drawer in your dresser to storing all of your Beatle shirts, sweatshirts, and the like. It’s actually getting ridiculous. – You’ve made multiple photo albums on your iPod dedicated to the Beatles. Taking it one step further, your one for George, entitled, rather appropriately, “Gorgeous George!”, contains over 200 pictures of him. Yeah, you’re officially obsessed. – You make sure to wear a Beatle shirt every couple of weeks or so just to ensure that the general public is aware that you’re still a Beatlemaniac, just like you were last month. Wouldn’t want anyone getting suspicious! – You Google random things about the Beatles when you’re bored. – You email pictures of the Beatles to yourself and take excessive screen shots on your iPod when the “save image” feature on the Google app stops working, because you’re determined to continue collecting Beatle pictures, and nothing is going to stop you! – Your Beatle stuff has taken over the room that you share with your sister. Oh well, she better start liking them, because that Beatle poster is NOT coming off the wall! – You sometimes take pictures of yourself with your Beatle posters, just for fun. George, smile!!! – You shout YAY!!!! whenever a Beatles song comes on the radio. Time to celebrate! – You’ve decided that at your wedding, you will only dance to Beatles or Beatle-related music. Hopefully, your future spouse is willing to go along with that. – You feel awkward when you’re at a party and there’s no Beatles music playing. However, there is crappy modern music playing, and though basically everyone else is dancing to it, you’re not. Then, when Twist and Shout or Birthday is FINALLY played, you’re the ONLY one singing along, and your peers don’t seem to know what hit them. It’s really a shame how this seems to work in the real world, as opposed to in your head, where everyone your age loves the Beatles. – You hear someone mention the rubber sole of a shoe and you can only think of your favorite Beatle album with the same name. – You often walk around the house on weekends singing Beatles songs to yourself and anyone who cares to listen, which is usually no one. – You excitedly freak out, just a little, when there’s a Beatle question on Jeopardy. Of course, you ALWAYS know the answer! And for those of my friends who think otherwise, for the last time, Jeopardy is NOT my favorite TV show!!! – You love to challenge your Beatle-inclined friends to a friendly, but fiercely competitive game of Beatles Trivial Pursuit, and even when it’s just you against all of them, you win by a landslide. – You make a foolish bet with your friend, and if you lose, you have to say something bad about the Beatles, out loud, in public. 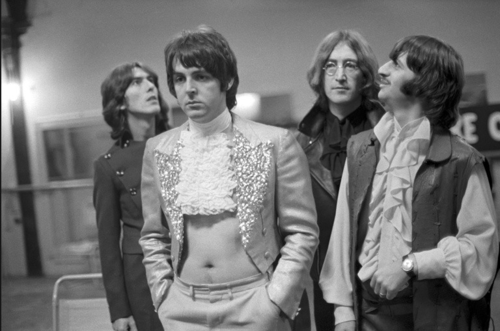 When you actually do lose the bet, which you never in a million years thought would happen, you chicken out and refuse to diss the Beatles in any way. Even though this goes against the bet, it’s what a true Beatlemaniac would do! – More than once, you’ve attempted to meditate while listening to Within You Without You. It didn’t work. – You nearly spit out your toothpaste when the announcers for your favorite sports team, in my case the Mets, mention the Beatles on the air while you’re brushing your teeth. – You get Back In The USSR stuck in your head every time the Soviet Union is mentioned in your history class. Also, you can only think, “LENNON?!?! ?” when Vladimir Lenin’s name is mentioned in class. And no, I’m not implying that John was a Communist. To be honest, his political affiliations don’t really interest me. – You get your dad to like George Harrison for you on Facebook, because you don’t actually have a Facebook. Yes, I realize that some other random person runs George’s Facebook page since he’s no longer alive, but honestly, I’m pretty sure that Paul and Ringo don’t run their own Facebook pages either, so what’s the difference? – You kill time in math class by typing love letters to George on your calculator. Thank God for the alpha lock feature! – You always sing along when abridged cover versions of Beatles songs are featured in commercials. Who cares if it’s a commercial for Tropicana orange juice, which you don’t even like? They’re singing Good Day Sunshine!!! That’s all I’ve got for now. Have a great weekend! You Know You’re a Beatlemaniac… Part 4! Yes, it’s back! It’s been over a month since I posted part 3 of “You Know You’re a Beatlemaniac,” and I’ve come up with more symptoms of Beatlemaniacism to share with you! Enjoy! – You feel like doing the Twist every time you hear She Loves You or Twist and Shout. – Your teacher asks who in the class likes the Beatles, and your hand shoots in the air before anyone else’s and waves enthusiastically. – You had a dream that you met Paul. Unfortunately, when you woke up, it was all in the mind. – You’ve had three separate dreams about George, and you remember each of them perfectly! – You honestly feel that Magical Mystery Tour is a good movie. It takes a true Beatle fan to appreciate this movie, and you certainly do! – Watching Yellow Submarine makes you feel deliriously happy, for some strange reason. – You’re considering writing essays about the Beatles over the summer in your spare time, just for fun. If I do, I’ll post them here! – You’ve planned out in your head exactly how, in an alternate universe, you and George would meet and fall in love. It’s basically a fan fiction inside your head. – You ALWAYS have a Beatles song stuck in your head, sometimes more than one at a time! Last week, it was I’m Happy Just To Dance With You for 3 days straight! GEORGE!!! – You find yourself smiling like a goofball when listening to certain Beatles songs because they make you feel really happy! For me, the song Every Little Thing on Beatles for Sale always makes me smile when it comes on my iPod. Actually, the whole Beatles for Sale album makes me feel really happy! – You’ve tried unsuccessfully to harmonize with yourself while singing along to Beatles songs because you know all the vocal parts by heart, so you don’t know which one to sing! – You draw a heart around any Beatle names that appear in your homework or class work. If “Paul” shows up just once in your French packet, everyone within a 10 foot radius of you will know. – You classify your various moods based on the personality of each Beatle. Some days, you’re in a Paul mood, some days you feel more like George, and some days, you’re a combination of all four! Those are the best days! And no, you don’t have multiple Beatle personality disorder. – You’ve invented lefty “air bass” solely to imitate Paul. – You’re considering starting a campaign for Dhani Harrison to be on Dancing with the Stars. Having Paul or Ringo on the show would be even more amazing, but really, they’re too famous for Dancing with the Stars! – Any time you have a headache, it magically disappears after listening to the Beatles. They honestly should be prescribed as medicine, because you can’t count how many times they’ve made you feel better. That’s all for now. Have a fab weekend!